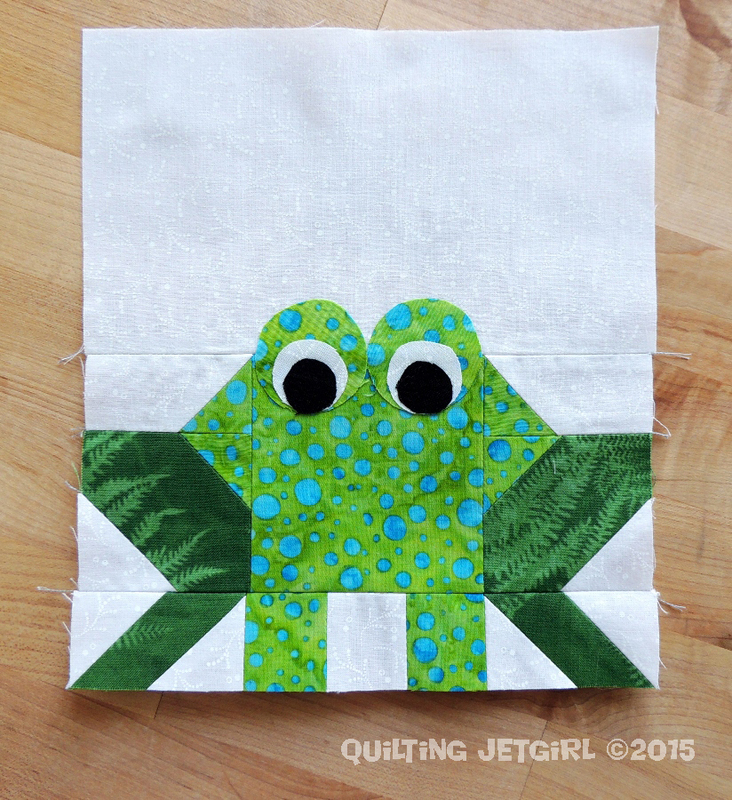 This week it only took me 40 minutes to whip up the (1) block for the Elephant Parade QAL: a super fun frog. My husband *loves* frogs, so I asked him to dig through my stash with me to pick out the fabrics for this cute little guy. I chose to also fuse down the black centers of the frog’s eyes for my block. Both your frogs are adorable, Yvonne. Love the spotty fabric you chose and those cute eyes! Thanks, Lorna. I am having a lot of fun with your awesome pattern! Love the fern fabric! Looks great as a frog! Oh man, I didn’t know there were gonna be frogs in your cute elephant quilt! That just ups the cuteness factor! And I think a turtle, too, Beth! This frog is so cute! I totally want to make one of these blocks. I love singing frogs! They make me so nostalgic. Your little green guy is so cute. Nice fabric pull, hubby. Are you on a place yet bound for Austin? Hope so… See you soon! Thanks, my hubby and I had fun with this cute guy. I am at LAX right now waiting on my flight! See you soon! Hi!!!!! Your little frog and the real little frog are both too cute!!!!! I am glad they get taken to safety by your hubs!!!! Very sweet!!!!! So cute! I love that your husband helped you pick the perfect frog fabric. And his photography is excellent. I made two frog blocks last week, but I need to finish the third before I go public. Oh, I hate it when that happens. I bet you do really well piecing the third, though! I love the frog, Yvonne! And that’s a fantastic photo Michael took of the cute little guy in real life. Can hardly wait to see the finished quilt! Love frogs, and yours is especially cute, great fabric choices I think. Thank you, Sally! It was fun to put together and collaborate with my husband a bit, too!